The classroom toilet – that one place in school that seems to haunt me. I compare it to ‘The Wall’ in ‘Game of Thrones'; you simply don’t venture beyond the door. I often wonder if – indeed – a great battle takes place in there during my topic afternoons!? I’m sure I don’t need to go into detail. How our faces drop when a family member pops in at the end of the day with a red-faced sibling for a cheeky toilet-stop; how we wait for the ground to open up and devour us. Well not anymore. Last month, we cracked (or at least our girls did!). Something had to be done. I had tried the ping-pong ball last year after learning of its potential from an old book of teaching myths and legends. That ball lasted about four hours; never to be seen again. This time would prove to be different. 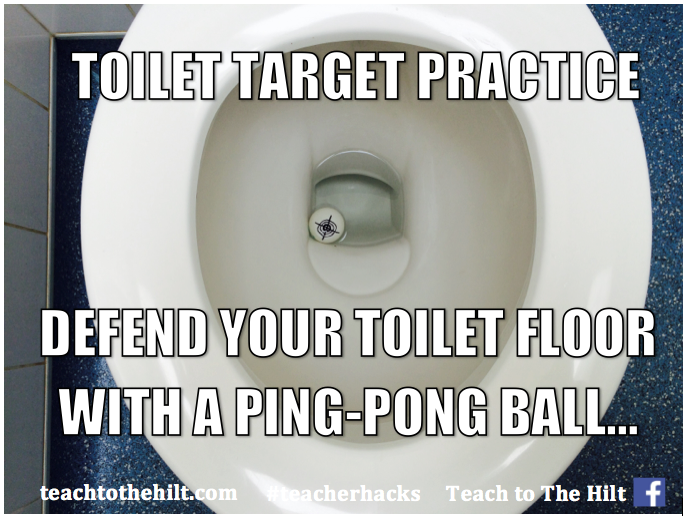 The theory is to leave the ball bobbing around in the toilet as a target for the boys. It won’t flush; it’s self-cleaning (you’ll have to trust us on that one!) and – most importantly – it works! Over the last month, our toilet floor has looked the same at hometime as it does during registration. Spotless. Flawless. Dry. The boys love it; the girls are happy again and our caretaker cannot get enough of it!